Try to work directly with the cards rather than sit with a guidebook next to you. The reason for this is that to read tarot, we need intuition and creativity (a right-brain function, the sphere associated with images and dreams). When we read words, we’re engaging the logical right brain – which judges what we’re doing, and can disconnect us from our intuition. Swapping between words and images during a reading can certainly interrupt the flow! The three techniques here ask you to use your intuition and imagination in whichever way feels right. 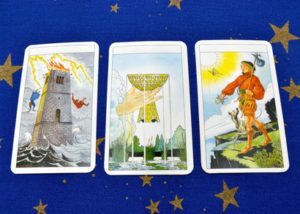 So don’t get hooked on learning any more card meanings for now – you can do a great tarot reading without them. Here’s how. Note which symbols attract you instantly; don’t think about it. Your intuition, which is stimulated by imagery rather than words, guides you to notice the symbols that are the most important for you or your client now. The next time you look at the same card, you may be drawn to a different symbol. This is why a professional reader might have the same three cards for two clients, but give them very different readings. The symbols you notice first can help you instantly decode a card’s meaning. If you’re drawn to animals on any of the cards, for example, the message is about following our instincts. Fascinated by the Sun on The Sun card? Say aloud what the sun means for you – heat, light, warmth, holidays? The meaning is emerging…! The word ‘arcana’ means ‘secret’ , or ‘key’. The 78-card tarot deck is divided into 22 major and 56 minor arcana cards. When you lay them out to give a reading, you’re creating pathways – a map – showing approaches to your past and ways forward into the future. How to read the majors: Where are you on your journey? In a reading, look at the Major arcana cards first (these are the cards numbered 0-XXI). They show you the priorities – the most important themes of your reading. If the cards are numbered 0-IX, we’re in the first phase of a journey. As a signifier of a situation, low-numbered majors mean a young situation – a relationship, career, project, or new home, for example. Card X, The Wheel of Fortune: mid-cycle; Fate takes a hand, and circumstances move us up to the second phase of the journey. How to read the minors: How are you travelling? The Pentacles cards link with the physical reality – the material world and the body. Pentacles show that practical matters – home, money, work – are key issues right now. The Cups cards link with emotions – love and other relationships. Cups reveal your feelings. The Wands cards link with passion and communication – desire, creativity and inspiration. Wands show there’s lots of movement, activity and talking. The Swords cards link with the mind – thought, analysis and decisions. Swords show there’s opposition and ego around. Finally, look for what’s missing. Why are there no Cups and lots of Swords cards when you’re asking your cards about a relationship? (ask, ‘Where’s the love? Is it all just drama?) Does the fact that there are lots of Wands cards and few Pentacles mean you’re distracted from finances just now? Reading the tarot is telling a story. Something magical happens when you begin to talk without knowing the end of the story – just look at the cards before you as if they are characters in a fairy tale. The deck is full of archetypes – from Knights, Kings and Queens to the sage (The Hermit), the maiden (The Star) to the evil sorcerer (The Devil); the young adventurer (The Fool), to The Magician. Working with archetypes stirs us at a very deep, primal level; it connects us with an old wisdom we have about ourselves. Take The Fool from your deck and place him face-up on the left. They lay four cards to the right of him, in a line. The Fool is the young hero of your story (which can be male or female). Turn over the remaining cards, but just one at a time, and interpret it, then move on to the next card. What happens to Fool next on his journey? Ask yourself: is this my journey, too?